From feminist fists to images of Rosie the Riveter, symbols of girl power come in all shapes and sizes. 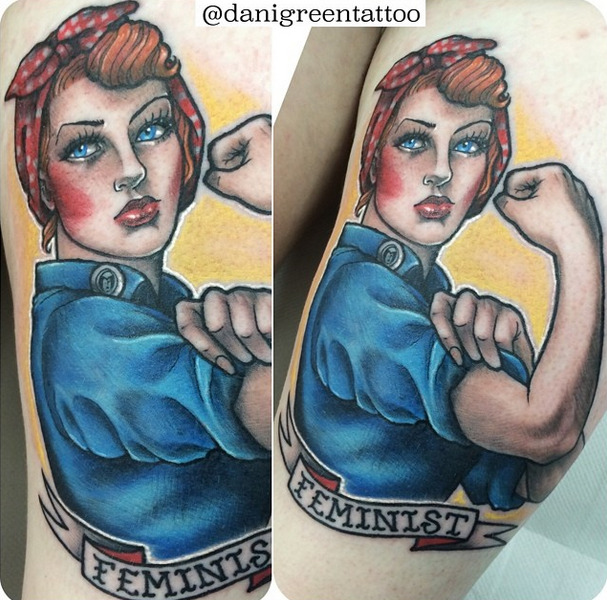 With Pew Research reporting that approximately 23% of Americans (and 38% of millennials) have tattoos, it&apos;s no surprise that more and more young women are proudly proclaiming their feminism through some ink. Celebrities like Lena Dunham, Janeane Garofalo, Joan Jett and Rihanna have all shown us their feminist-inspired body art. CNN even recently wrote about University of Maryland student/Notorious RBG fan Rachel Fink, who got a tattoo of Supreme Court Justice Ruth Bader Ginsburg on her upper arm. Tattoos are a form of self-expression, and plenty of women are clearly using them to proclaim their feminism loud and clear. 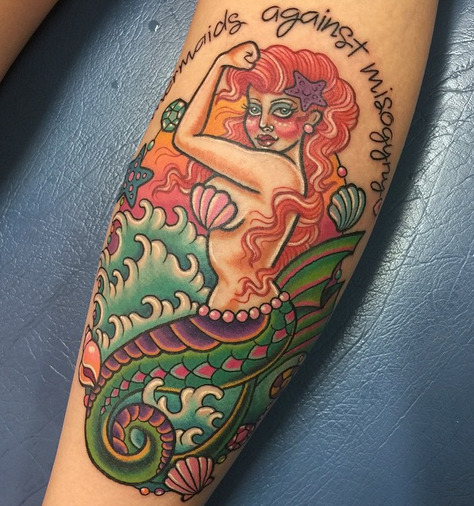 Whether through words or images, these tattoos prove to us that feminism can be rendered in myriad ways, with as much diversity as those who bear the tattoos. Looking for some inspiration? 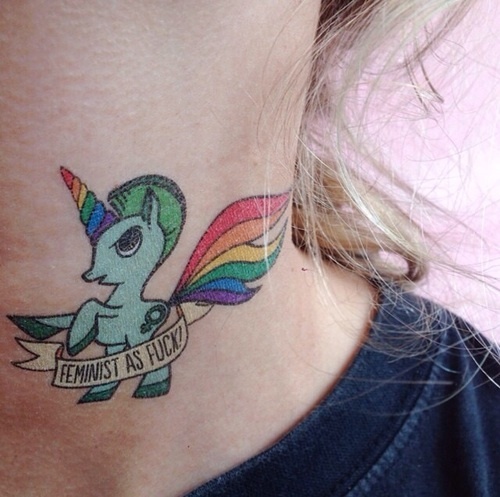 Check out some of our favorite feminist tattoos below, from around the Internet and provided by prominent feminists themselves. Jessica Valenti, feminist author and columnist at the Guardian U.S.
"When I gave [my daughter] Layla the middle name &apos;Sorella,&apos; which means sister in Italian, it was both for my own sister Vanessa, whom I&apos;m very close with, and a nod to feminism. I got the tattoo to commemorate a really difficult time related to my daughter&apos;s birth and early life — she was born very premature, I almost died giving birth to her, she had a lot of medical difficulties and I suffered from PTSD as a result. But we both came out of it and she is healthy and wonderful. That said, my family really was forever marked by what happened, so I love having something beautiful to remind me of how strong we are." 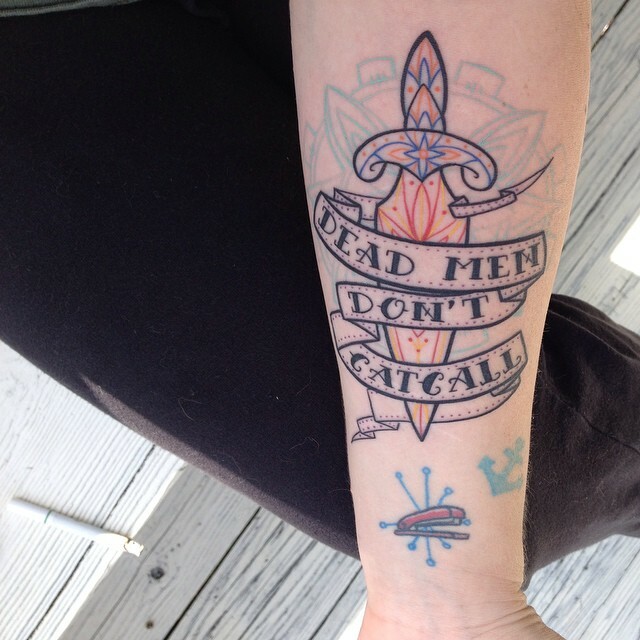 "For me, this tattoo is feminist in two ways. One, because I have a tattoo at all. Being a feminist is about taking full ownership of my body and decorating it as I see fit. Two, because there is one variety of octopus that can make itself blend into its surroundings so that no one knows its there. "As a feminist, I feel I must often blend and morph in order to move through the world safely and to make change. I can infiltrate any space. I can fit in however I need to. Or not, if that&apos;s what the situation calls for. The anchor symbolizes stability. The fact that it&apos;s on the octopus&apos; tentacle symbolizes mobility. I can drop anchor when I want and need to and I can move it when I want and need to as well. I am my own anchor, my own harbor, regardless of the waves that may rage around me." 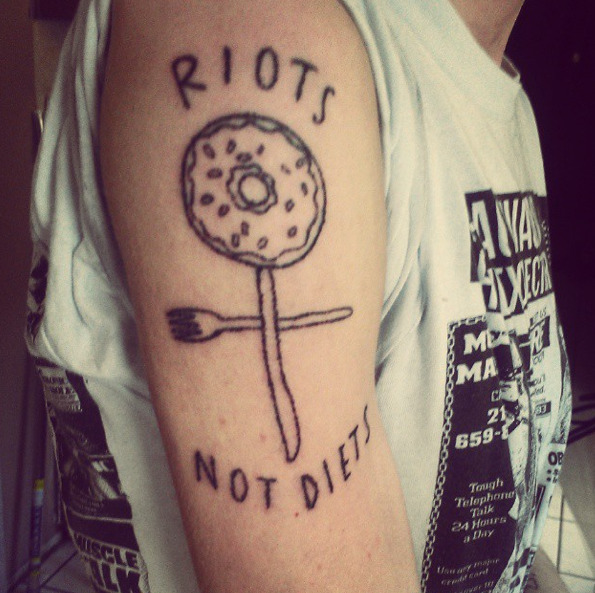 "I got the tattoo as social commentary. In my culture, I feel as though women are dismissed a lot with this one-liner: &apos;loca.&apos; As Gloria Anzaldúa says, there are only three directions a lot of us can go: &apos;to the church as a nun, to the streets as a prostitute or to the home as a mother.&apos; As someone who is unwed, childless and in academia, I am too unattached and too fresa. And since there is no present male-body to validate me, I am often just called &apos;loca.&apos; So I have chosen to reclaim that word, because if being loca means that I love myself, think critically and value my future outside of a hetero-monogamous union — then loca I will remain." 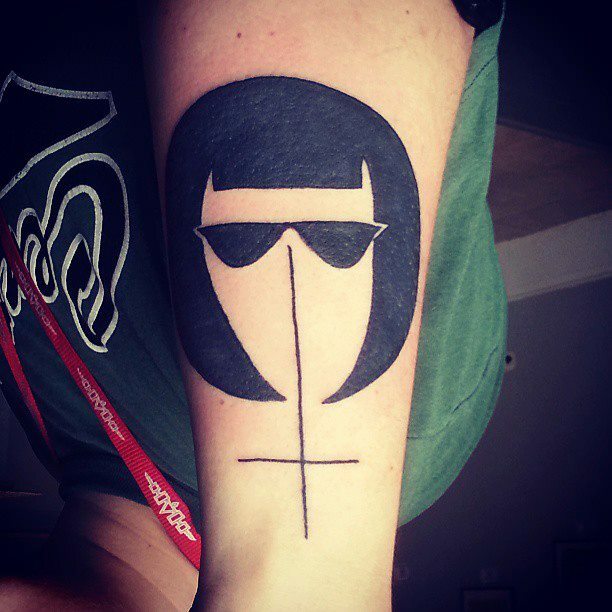 "On my lower right forearm I have a trans symbol, and on my left forearm a black triangle. I see both pieces as feminist because as a genderqueer dyke, my feminism is deeply rooted within my queer lived experience and politics." "On the cusp of legal adulthood, I got this lower-back tattoo to symbolize my nascent feminism — which, at the time, amounted to little more than &apos;women are powerful.&apos;"
"This is what I call my black sheep tattoo. To me it symbolizes that I might be different from the herd but there&apos;s always at least one other woman (probably a queer one!) who will support and understand me. 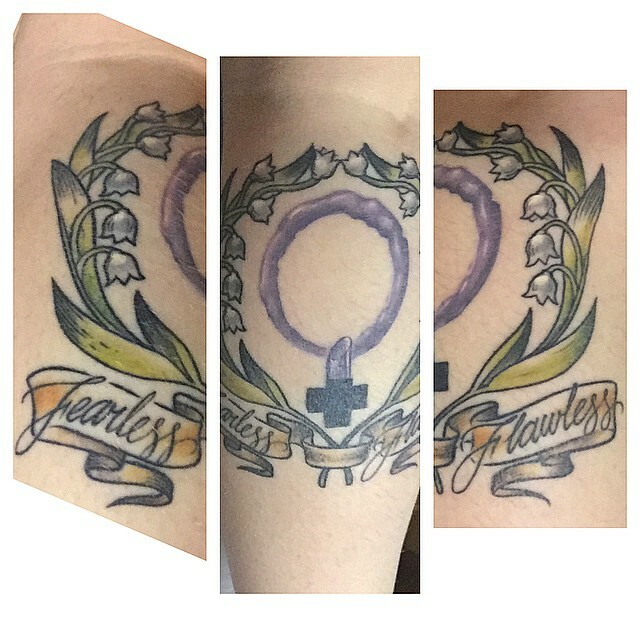 So it&apos;s my gay feminist tattoo." Updated: March 12, 2015, 5:44 p.m.